It’s the final countdown! My first Cannonball! Anyway, The BFG… Like I said in my penultimate review, my 6 year old niece recommended this book to me. We watched the movie together, and I thought it was a sweet story. I’m actually glad I watched the movie first. The BFG (Big Friendly Giant) speaks in an unusual way. He basically home-schooled himself, so his words get a little mixed up. I got to see the BFG on the screen talk, so I read his story (in my head) in that voice, and it really helped. I don’t envy the editor of this book though, because spell check would not have worked! I can imagine how cute this book would be to read to your kid at night. The BFG is not a people-eating (human bean eating) giant, but the other giants around him are. He politely kidnaps an orphan named Sophie because she saw him on the street in the middle of the night. He takes her back to his cave and tells her about his life. 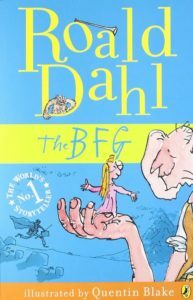 Sophie learns about all the bad people-eating giants and goes on dream catching adventures with the BFG. It’s all very cute. You come to love the BFG, and so does Sophie. They come up with a plan to save the human beans from the bad giants. I absolutely recommend this book, and also the movie. The BFG was a really nice, sweet, happy way to end my first full Cannonball! I’ll have to thank Olivia for suggesting it. Share the post "It’s the final countdown! My first Cannonball!" I love to read. I'm usually reading at least 3 books at a time. They're not all good... some are really bad. I have trouble not finishing books though. Now CBR has doubled down on that trouble, because I want to get credit for reading the bad ones too! Congrats! You made it! Happy Cannonball! Woohoo! Happy Cannonball! Well done for doubling your achievement from last year. Congrats! And how nice to get your first full cannonball on such a great book! Congratulations on your first cannonball! Congratulations! And god, I love this book! Congratulations on making it to your cannonball! I’ve made a couple different cannonball goals over the years, and each one is a victory, no matter the number. Continue reveling in your accomplishment.